The Florida Current is a strong oceanic current flowing northward along the eastern coast of Florida carrying warm tropical waters that eventually feed the Gulf Stream. The Florida Current represents both the western boundary current for the subtropical wind-driven gyre as well as a return pathway for the Thermohaline Overturning Cell, which consists of a slow circulation redistributing the waters of the world ocean based on sinking at the high latitudes and upwelling elsewhere. The Thermohaline Overturning Cell has been documented to have strong impacts on the global climate, and as such variations in the Florida Current, which returns surface waters to the northern North Atlantic, represent an important climate signal to be monitored. 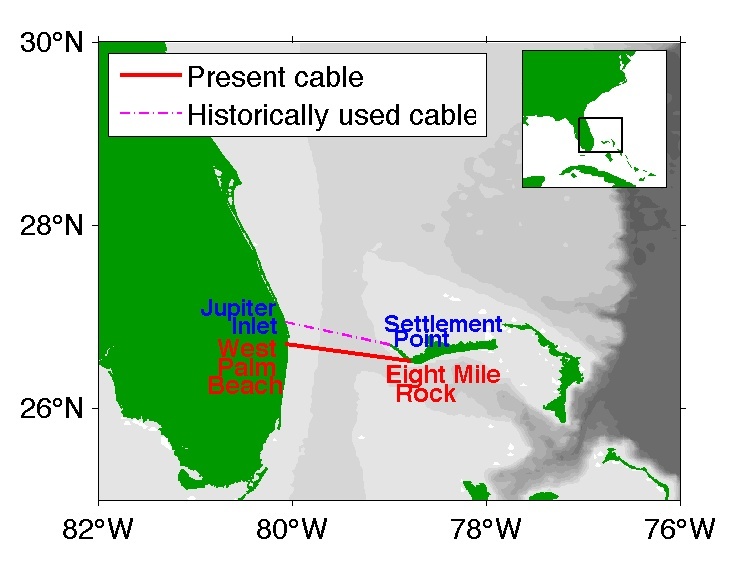 Since 1982, NOAA has recognized the importance of long-term monitoring of the Florida Current and it has funded a project, as part of the Western Boundary Time Series project in the Atlantic Ocean, to monitor the transport variations of the current using a submarine cable and snapshot estimates made by shipboard instruments. This webpage presents the results of this study.